IT IS NOT SO much the length of a prayer, but the fervor with which it is said which pleases Almighty God and touches His Heart. One single Hail Mary that is said properly is worth more than one hundred and fifty that are badly said. Most Catholics say the Rosary, the whole fifteen mysteries or five of them anyway or, at least a few decades. So why is it then that so few of them give up their sins and go forward in the spiritual life? Surely it must be because they are not saying them as they should. It is a good thing to think over how we should pray if we really want to please God and become more holy. IN ORDER TO pray well, it is not enough to give expression to our petitions by means of that most excellent of all prayers, the Rosary, but we must also pray with real concentration for God listens more to the voice of the heart than that of the mouth. To be guilty of willful distractions during prayer would show a great lack of respect and reverence; it would make our Rosaries fruitless and would make us guilty of sin. How can we expect God to listen to us if we ourselves do not pay attention to what we are saying? 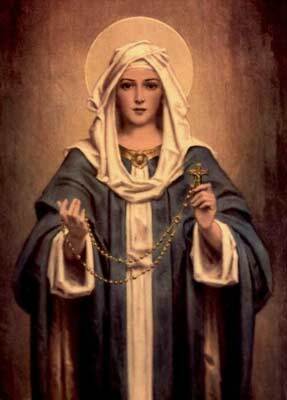 Of course, you cannot possibly say your Rosary without having a few involuntary distractions and it is hard to say even one Hail Mary without your imagination troubling you a little (for our imagination is, alas, never still). The one thing you can do, however, is to say your Rosary without giving in to distractions deliberately and you can take all sorts of precautions to lessen involuntary distractions and to control your imagination. With this in mind put yourself in the presence of God and imagine that Almighty God and His Blessed Mother are watching you and that your guardian Angel is standing at your right hand, taking your Hail Marys, if they are well said, and using them like roses to make crowns for Jesus and Mary. Above all, do not forget to offer up each decade in honor of one of the mysteries and while you are saying it try to form a picture in your mind of Jesus and Mary in connection with this mystery. Do not listen to the devil, but be of good heart even if your imagination has been bothering you throughout your Rosary, filling your mind with all kinds of distracting thoughts----as long as you really tried hard to get rid of them as soon as they came. Always remember that the best Rosary is the one with the most merit, and there is more merit in praying when it is hard than when it is easy. So all of you, servants and handmaids of Our Lord Jesus Christ and the Blessed Virgin Mary, who have made up your minds to say the Rosary every day, be of good heart. Do not let the flies (it is thus that I call the distractions that make war on you during prayer) make you cowardly abandon the company of Jesus and Mary, in whose holy presence you always are when saying the Rosary. NOTE: As I will be on vacation from October 3rd through the 14th, the comment box will be closed. It will be opened from the 15th.